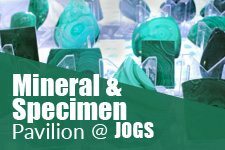 Attending the Tucson Gem Show and want to see which of your favorite exhibitors will be at the JOGS Show? Below is a list of exhibitors and vendors from the 2018 JOGS Show. Unique fossils, mineral and gemstone handmade jewelry in sterling silver and zero karat gold. Polished Colombian Amber and jewelry. 18k diamond jewelry and 18k South sea pearl jewelry. Fine jewelry, diamonds and precious stones. Silver jewelry and loose gem stones. Turkish import mosaic lamps, textiles, boots and shoes. Amber, turquoise jewelry and artifacts. Indian sterling silver and turquoise jewelry along with Native American arts and crafts. Pendants, rings, earrings, necklaces and bracelets from Bali. Dioptase cabs, turquoise cabs and rough. Fine jewelry in gold, diamond jewelry, loose color stones and cabochons. Natural coral, amber and gemstones. 90 Wanking E. Rd. Zhong Shan Dist. Manufacturer and designer of silver, stainless steel, fashion, and marcasite jewelry with gemstones. Semi-precious stones, stone bead necklaces, pendants and cabochons. Premium quality 925 sterling silver and gemstone jewelry. High end fashion jewelry made with Swarovski crystals. Fine jewelry, diamonds, colored stones, gold and silver jewelry. Finished jewelry, rough and cut stones, 100 percent natural Cripple Creek and Kingman turquoise, tigers eye slabs, rhododendron, opalite, opal eye. One-of-a-kind handmade sterling silver jewelry with intricate inlay designs. Silver jewelry, handcrafted finished silver jewelry. Minerals of Peru, rhodochrosite, pyrite, tumbled, Cabochons, animal carvings and Tree of Peruvian Stones. Custom cut matched pairs. Diamond & gemstone beads & briolettes. Pave & bezel set gemstones. Gemstone wire wrap chains & necklaces. 925 Sterling silver jewelry with semi-precious stones, larimar jewelry. Native American jewelry, Southwestern silver jewelry. 925 sterling silver chains, leather, cable abalone jewelry, buffalo bone jewelry. Manufacturers of 18K gold jewelry - not mass produced - with selected Colombian emeralds, which have been certified. We are also offering a gorgeous collection of clean, sparkling, first-class stones. Queensland Boulder Opal - Unset/Drilled/Silver Jewelry/18k Gold Jewelry - Australian Crocodile Leather - Raw Leather/Finished Belts. Wind spinners, home and garden decor. Manufacturer and exporter of finest quality gold and silver jewelry in gemstones. Tahitian and South Sea pearl fine jewelry in 14K, 18K gold and sterling silver. Freshwater cultured pearls, pearl necklaces, pearl earrings, pearl loose necklaces, pearl bracelets and pendants. Handcrafted sterling silver 925 jewelry made in Bali: earrings, rings, chains etc. Natural stones directly from the mine. Created stones. 1249/151 Gems Tower 17th Fl., Charoenkrung Rd. Pewter findings, glass beads, pendants, cords, etc. 14k and 18K fine jewelry, helenite jewelry, obsidianite jewelry, 925 sterling silver, rings, pendants, earrings, larimar, opals, semi-precious stones. Precious stones, rubies, sapphires, emeralds, cut stones. Amber jewelry set in silver and gold. Rubies, sapphires, pearls, opals, corals and large variety of other precious stones. Handmade sterling silver jewelry with gemstones from Bali. Silver jewelry with semi-precious stones. Distinctive Bali jewelry designs, sterling silver jewelry. Gem stones and silver jewelry, round beads, oval cabochons, pear shape, T.V. cushion, sq. cushion, cushion and long-oval, faceted, donuts, free form, chips, necklace, bracelets, earrings, rings and pendants. Gold-filled silver jewelry, pearl jewelry and macrame. Hand-carved amber carvings and cameos, amber in silver. Handcrafted sterling silver jewelry from Thousand Island of Indonesia. Wholesaler and manufacturer of fine silver jewelry and chains. Ethiopian opal, Ethiopian emeralds, Ethiopian sapphire, green garnet, etc., loose and rough. Sterling silver earrings, necklaces, rings, bracelets, pendants, bangles, Bali chains. Charoites, shungites, seraphinites, rainbow pyrites, astrophyllites. Native American, sterling silver chains and jewelry, opal jewelry, jewelry displays and supplies. Red coral gems and jewelry in gold and silver. Gold and diamond jewelry, rubies, sapphires. Fashion jewelry including necklaces, bracelets, bangles, buckles, earrings and rings. Exclusive distributor of lucky stone jewelry, mystic topaz jewelry, golden and silver jewelry. Onyx, agate, rhodochrosite carvings, lapis lazuli, etc. Genuine crocodile and exotic leather products. Sterling silver jewelry with semi-precious and unusual stones, Russian hand painted jewelry, currency and silver boxes. Turquoise rough, cabs and jewelry. Production and one-of-a-kind art jewelry, stones, found objects, sterling silver jewelry. Fashion jewelry designer as seen in department stores and on TV. Lighting ridge, black opals from Australia. Australian opals and opal jewelry sets in sterling silver. Amber jewelry, modern sterling silver jewelry with amber. Lapis lazuli and other gemstones. Natural stones in oval, round, rondelle, nuggets, briolettes (drops, pears, heart & fancy), square, chips and many more fancy shapes in both faceted and non faceted, from mainly Brazilian and African material. Semi-precious stones, cut stones, rough stones, and cabochons. Designer, nickel-free sterling silver jewelry with gemstones, spinner rings. Precious and semi-precious stones and coral beads. World largest selection of cabochons, semi-precious stones, rough lapis, malachite, pietersite, labradorite. Blue Chalcedony beads, cabochons, bracelets and carvings. Natural blue or light blue without any artificial coloring or dying. Fine jewelry with all kind of stones. Native American and Southwestern jewelry. Many different styles and price ranges. .925 sterling designer silver jewelry studded wit semi-precious stones. Gems jewellery, rubs, sapphire 18k gold and silver beads. Manufacturer of silver marcasite jewelry. Jewelry, loose, rough opal stones. Shell heishi beads jewelry, bone & horn beads, wood beads, shell pendants. We carry the finest material specimens, gemstones and cabochons from this world and beyond. We specialize in Meteorite, Moldavite, Amber, Silver Jewelry, Cabochons, Navajo Rugs and Mana pottery. Synthetic gemstones, semi-precious gemstones, silver jewelry. Fine jewelry in silver studded with real stones. Precious & semi-precious gemstones, diamond jewelery. Knitting products, scarfs, headbands and accessories. Tahitian pearls, South sea pearls and keshi. Precious sapphires, colored gemstones from all over the world, and fine gold jewelry studded with gemstones. Precious sapphires, colored gemstones from all over the world and fine gold jewelry studded with gemstones. Jewelry design with larimar stones. Myra Gumus Ve Kuyumculuk San. Tic. Ltd. STI. Ruby all types, green garnet sun-stone (all types), tanzanite all types, sapphires, spinel, diamond, aquamarine. Guangzhou Dongjiuduo Jewelry Co. Ltd.
Booth GB79, North Tower, Liwan Plaza, Changshou Rd. Adjustable bracelets, expandable bangles, snap jewelry, beads, pendants, and wrap bracelets. Vidda brings edgy jewelry handcrafted in Spain. We combine genuine leather and silver plated metal parts creating a unique jewelry style. Swarovski crystals and high quality resins are the perfect addition to bring color to our designs. Handicrafts, jewelry, Thanka, singing bowls. Conch shell jewelry, turquoise and diamonds. Rough, loose, cut and finished products with turquoise from Iran, designer jewelry with turquoise. Semi precious and precious stone beads, bead bezels, beaded chains, diamond beads, 18kt gold bead chains, mother of pearl and abalone bezels, electroplated druzy beads. Ethiopian emeralds, rough ethiopian opals. Natural loose and cut gemstones sapphires,rubies, Cambodian Blue Zircon. High-frequency jewelry that helps promote healing in the body. Opals, emeralds, sapphires, garnets, amethysts, aquamarine, routile. Handmade sterling silver Tibetan jewelry, beads, & artifacts.